This book was the inspiration for the latest Design Team Challenge over at SBO from Vicky. And it is such a cool book by an American author Dallas Clayton - check it out here! From what I can tell I think it may only be available in the US, but I so want my own copy! I love the 'cloud' paper. Such a peaceful photo too. Such a serene layout Mich.
awww thats cute that layout. Mel from oz had that book on her blog I am sure she did and she got hers in oz. I love the mamma mia thoughts too, so cute. 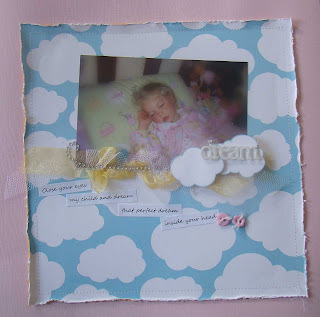 Lovely layout and dream story!